Ciaràn does it again for Ingimex! Ciaràn McEvoy, who spent last year on a work placement with Ingimex, has won the top award at the national awards for “The Year in Industry” programme which is run by charity EDT. His success follows that of Adrian Schmieder another Ingimex ‘Year in Industry’ student who took the “Innovation” award last year. 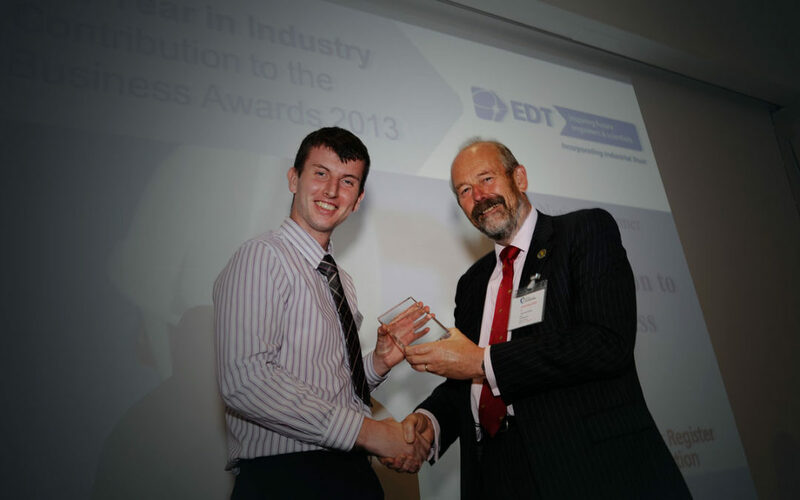 Ciarán, who took the working gap year before going on to study Mechanical Engineering at Newcastle University, won the top ranking “Contribution to the Business Award” at The Year in Industry Awards which took place at the Royal Academy of Engineering on Thursday 19th September. The prize is sponsored by the Institute for Engineering and Technology and is awarded by a panel of judges from major UK companies. “Ingimex is a strong advocate of ‘The Year in Industry’ as the programme provides genuine two way benefits for the company and the student. As a company we get to work with some exceptional raw talent that is looking for experience before going on to university. This means that we can give them projects which are beyond the day to day, and which can help our engineering team make step changes in the way we do things. The student has the benefit of developing those skills that they don’t teach at school or university; how to work in teams, how to persuade and influence people, how to manage projects, how to manage time and how to present ideas. We always like to keep in touch with our students once they have gone to university and they will often come back to us for full or part time work. Ciarán did exceptionally well to achieve such a successful outcome while working with experienced and mature engineers. His tact and good humour enabled him to see the project through from design to final delivery of the system and a successful implementation involving all the panel assembly operators”. The system Ciarán developed virtually automated the transition of the side panel assembly onto the next stage. The overall time taken at this step was greatly reduced, as he entirely removed a bottleneck and subsequent downtime. The process itself was simplified and made more manageable for the operators and the transition is now a smooth, single movement, assisted by a roller table assembly and lifting mechanism that Ciarán designed and introduced. The net result of this work was a reduction by a third of a critical stage in building the Luton van. For Ciarán his chances to win awards will not stop here because as winner of the Year in Industry Award he will automatically go forward to participate in the Engineering Employers Federation National Manufacturing Student of the Year Award.